Every mom is a fan, follower, disciple and what not of Pressure cooker. The brand loyalty of the home maker was so strongly associated with this pressure cooker until the launch of Pressure Rice-Cooker . Though expensive but it is a very convenient and a reliable way of cooking rice. In my opinion, the more you spend on a rice cooker, the better it will cook rice. But before you buy rice cooker with pressure or without it, you should ask yourself, how often you're gonna cook rice? The more often you cook the more I think you better get a best rice cooker and pressure rice cooker is different from rice cooker. It has attractive features which make it stand apart from the other conventional cooker. It comes with different brand names. Sanyo ECJ-PX 50S: This is the cheapest model available in the market of North America. This is priced low because it is similar to the conventional rice cooker. Zojirushi NP-HTC10 & Sanyo ECJ-JG10W: Available at double the price. This is priced double because of an additional induction heating system which adds to the cost. There are a lot of replicas of Rice Pressure Cooker which might be cheaper. The cheaper price of those cookers might lure you to buy them but be aware, they might not be the actual pressure rice cooker, as these are the latest in the market. For example: I found a free standing small electric appliance which was around $200. I mistook it to be for a pressure rice cooker as it too came with a programmable device. There are other Chinese models also available at a price as low as $100. Some of them are Korean proficiency means that the cooker can converse in Korean, that is before it starts cooking its speaks in korean telling that it is ready to cook and once done it again notifies us in korean only. It possesses all attractive features unlike the rest. This makes it a little expensive one to own. You can own one if you can free your pocket with $300 to 500$. Don’t literally go by its name, its way more useful than just cooking rice. You can cook a variety of dishes like cook meat, chicken, even a sponge cake and the list go on. You can also make a stew of vegetables, some meat if you wish and seasonings and set it to slow cook. It’s worth every penny as it does not restrict itself to cooking rice. Is Pressure Rice Cooker worth it? We have to think realistically before commenting on a kitchen appliance. From the little research I have done, I find it worth every penny as it cook’s way above rice. The other reason which makes it worth is its reliability and durability. Moreover we all know that a kitchen appliance never goes for a waste as food evokes every emotion in a human. “Makes life simpler” is the complimentary tagline achieved by its reviewers as you can program the cooking timings and get busy with your other works. Warmer feature to make sure it evenly distributes heat. Lower pressure and temperature for firmer rice, and higher pressure and heat for softer rice. 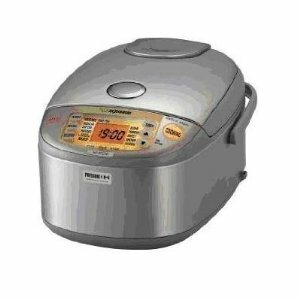 Visit zojirushi pressure rice cookers page for details review and information about other type and models.